Earn $67.00 in Podium Club credit (6700 points)What's This? 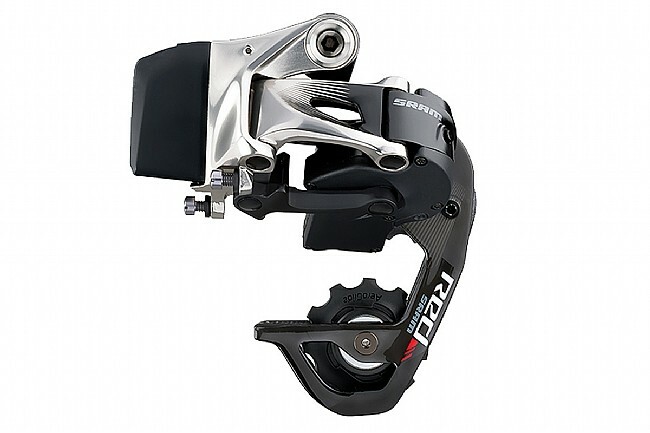 The SRAM Red eTap WiFLi Rear Derailleur connects to eTap electronic shifters for wireless shifting that's truly next-generation. It's equipped with a medium-length cage so it can handle 11-speed cassettes with wide gear ranges up to a 32-tooth large cog. Ceramic bearings keep it is as efficient as possible, and a carbon pulley cage ensures crisp shifting from top to bottom. Designed for SRAM PowerGlide™ and PowerdomeX™ 11-speed cassettes with up to a 32T large cog. Compatible with SRAM eTap wireless shifters only.